Dogs are more than just our pets. They’re our companions, our children’s best friends, our partners walking buddies and (sometimes) the postman’s worst nightmare! Our dogs are part of the family and their health and wellbeing is, more often than not, just as important as our own. Us humans often have a huge bond with our furry friends, we cuddle them at night, take them on holiday with us, bathe them with doggy shampoo and take care of them when they are unwell. This means it can be heart-breaking for us pet parents when our dogs have health problems and sensitivities, especially when it seems impossible to diagnose the problem. Dietary sensitivities, such as food allergies and food intolerances, can rear their ugly heads when you least expect it and can occur in dogs of any age. Often symptoms for both types of sensitivity are very similar and can be distressing for both dog and human. Read more about the symptoms you should look out for in our article “Is My Pet Sensitive?” if you think your dog might be struggling with a sensitive stomach. Where a food allergy or food intolerance has been identified, the most common way to deal with this is to use a sensitive diet to help improve your dogs’ quality of life. But firstly, how do you identify the offending ingredient/s? As a concerned pet parent you will start your quest into finding the triggers of the sensitives. When really the answer is fairly simple, most allergens affecting dogs are similar to those that cause dietary sensitivities with us humans. 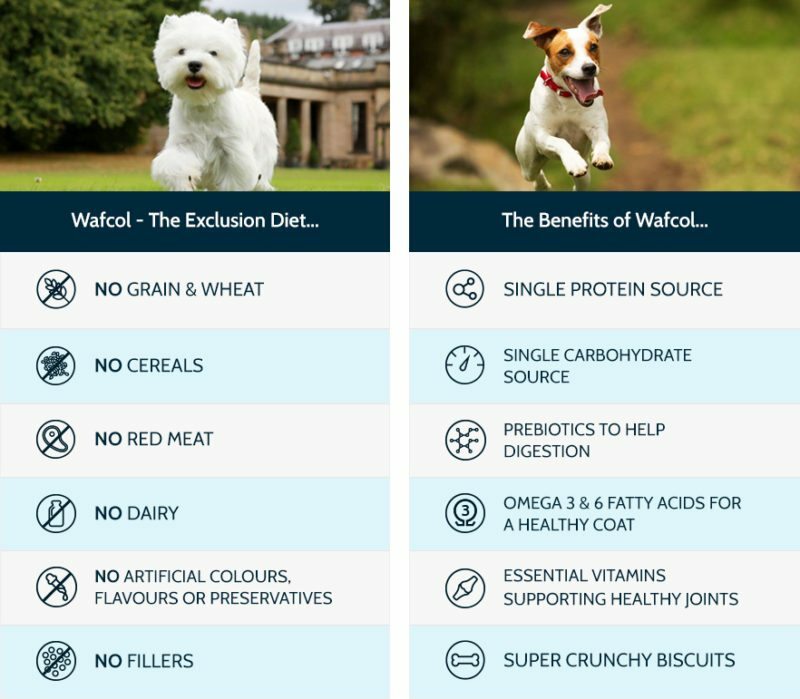 Our fantastic Wafcol Salmon & Potato recipe is a non-prescription sensitive diet offering you and your dog a tasty solution to their dietary sensitivities, that is competitively priced without compromising on quality. But don’t just take our word for it – take a look at the success stories of our wonderful Wafcol dogs and find out from their owners how Wafcol has changed their dogs’ life. Unlike other sensitive diets available, Wafcol is a true, pure sensitive diet. All our dog food recipes are developed to be sensitive on the digestion system and use a single source of animal or fish protein. The absolute minimal ingredients necessary are used to help you lower the risk of an allergic response from your dog. Our Salmon & Potato recipe is simply made from Salmon and Potato – no other fish or meats are used. Purity is our watchword and we are so proud of the ingredients we use. Each and every ingredient has its own health benefit – we don’t put it in unless we think it’s absolutely beneficial to your dog.